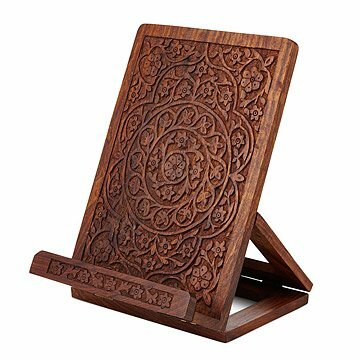 This wood stand is carved by Indian artisans with local flora and motifs drawn from traditional mandalas. Hand-carved by artisans of an Indian collective, this solid rosewood stand features intricate carving inspired by local flora and motifs drawn from traditional mandalas. Its folding, easel-inspired back adjusts to three different positions to keep cookbooks and iPads at the optimum angle on a desk or kitchen counter. When not in use, the stand also folds up flat for convenient storage. Handmade in India. They love it and even use it for reading books. Got this as a gift for my sister-in-law. It's beautifully carved. On a silly note, the stand was wrapped in some Indian newspaper inside the box, so now we also have a really awesome car ad from India that says... It's a carrrrrrrrrr! When I gave this to my mother for her birthday she said it was something that she has needed for a long time. I like that it is useful for cookbooks but also for a tablet if you are reading a recipe online. It's also nice that it folds up for easier storage when not in use. This was a gift for my mother's birthday. It's beautiful, BUT you can see the glue toward the bottom holding the lip on that holds up the cook books. That really disappointed me. It was too late to return it, but I was surprised at the carelessness there. Everything else we've ordered from Uncommon Goods in the past has been so great... We also got the Chakra candles, which she loves and I gave 5 stars. MY wife loved this item, and say I finally thought outside the box for a present for her. It arrived in the time specified & in great condition. Looks beautiful on my counter & it's nice to finally have a cookbook stand. I've been looking for a stand for some time but didn't like the ones that I've seen on other sites. I'm glad I kept searching.